This weekend devotees at ISKCON's center in Honolulu, Hawaii are marking the 40th anniversary of Srila Prabhupada's installing our Deities, Sri Sri Panca Tattva. Although I can't be there myself (only five of the original devotees from those days are there), I've been reflecting on my experiences with Krishna consciousness from those days. So I thought I'd post this draft of my introduction to Krishna consciousness there back in 1969 and 1970. It was certainly not what anyone expected to happen that weekend. I had been in the Navy for almost three years and served as an intelligence analyst at the Pacific Fleet Intelligence Center at Pearl Harbor. Because of the security clearances necessary for my work, I generally avoided going to concerts such as this one. It seemed that attending a Grateful Dead concert, or a Jefferson Airplane concert at Honolulu’s Civic Auditorium during the late ‘60s would draw unwanted attention. But here it was, a full-moon night in May of 1969, and I couldn’t resist seeing the Jimi Hendrix Experience live at the Waikiki Shell. After the warm-up band played, Jimi came out and played a couple of numbers. Then he mumbled something about the sound system not being powerful enough for his music and said he’d be back in fifteen minutes. After much more than fifteen minutes, one of the announcers from the local underground FM radio station, which promoted the concerts this weekend, announced that Jimi wouldn’t be able to play that night, but if we brought our ticket stubs on Sunday night, he’d perform for free. In the meantime, which might have been an hour or so, I heard a persistent sound from just outside the Shell: ching-ching-chiiiing, ching-ching-chiiiing, ching-ching-chiiiing, on and on. Sometimes it went faster, sometimes slower, but it never stopped during the entire break. As we left the Shell, what we found were perhaps the most exotic folks I had ever seen. There, under a large, rainbow-colored banner with the Hare Krishna mantra, were Govinda dasi, Jayasri, Sudama, Turiya das, and another young woman, playing karatals, a guitar, a rather exotic-looking drum, and chanting, “Hare Krishna, Hare Krishna, Krishna Krishna, Hare Hare, Hare Rama, Hare Rama, Rama Rama, Hare Hare.” As the crowd streamed out of the Shell, it gathered around the devotees, young people clapping, swaying, and chanting along. As I heard the mantra, I found it oddly familiar. Sure, I had heard the song from the tribal rock musical Hair on the radio, but this was different. After some time, the crowd had grown so large that it blocked the exit, and the police asked everyone to move away. So Sudama and Turiya das led the crowd across the grass into Kapiolani Park as the full moon seemed to smile on the now-enormous sankirtan party of several thousand chanting, dancing people. The kirtan’s energy seemed to build, and I found myself completely carried away, even though I was a shy guy in the Navy, short hair and all. Unfortunately, the police eventually broke the crowd up and ordered everyone to disperse. But the experience had left an indelible impression on me. When we went to the concerts the next two nights, the devotees were there again, and I found myself chanting with them much of the time. Afterward, I found myself listening to the Hare Krishna show on K-POI FM, the underground station, most Sunday mornings. My friends suggested a couple of times that I go spend time with the devotees out in the country, but I was a little nervous about getting that close. A couple of months later I got out of the Navy, and I returned to Hawaii early in the fall of ’69, with the intention of taking some time for surfing and “finding myself” before returning to college. I would sometimes go to concerts at the Waikiki Shell, and sometimes we would go for a walk in the evening down Kalakaua Avenue, hoping to meet interesting people. Wherever I went, it seemed the devotees were there. I couldn’t deny my attraction to the chanting, but I actually saw that as somewhat dangerous. After having been in the Navy, I was wary of ever joining anything again. So I would stand just out of sight, or on the other side of the street, and chant along. My friends and roommates would bring me Back to Godhead magazines, knowing that I was interested but guarded. One Saturday night, however, I had a surprise. As I left the center of Waikiki, I encountered a Hare Krishna monk on the other side of the street. It was Turiya das, one of the men I had chanted with the previous spring. We spoke for a few minutes, and when I left him he asked me to come to their Love Feast the next day at Queen’s Surf Park. I agreed, and we parted. The next morning I remembered that I had promised the Krishna monk that I’d go to their feast. I thought I had better not break a promise made to a monk, so I decided I would indeed go. I had seen the devotees distributing food in the park on Sunday afternoons, but I kept my distance because I was worried about how strongly I felt drawn to the chanting. Besides, their food, although vegetarian, appeared cooked, and I was trying to get into a raw-foods diet. But this Sunday I had determined that I would go and that I would open myself entirely to the chanting to see what it does. I even thought I should forego all my bad late-‘60s indulgences that day so I could experience the chanting with a clear head and an open heart. So there I found myself on a warm, sunny, early-winter’s afternoon, sitting on the grass near the ocean in my Levi’s and t-shirt, my eyes closed, chanting the maha-mantra over and over. Later, as prasadam was being distributed, Turiya das sat down with me and started a conversation. When he asked if I had ever read Bhagavad-gita, I found I had an admission to make. While in the Navy I developed a strong interest in the politics and philosophy of Mahatma Gandhi. I had read every book by and about him I could find in Honolulu. I had also tried reading several editions of Bhagavad-gita because of Gandhi’s interest in that ancient scripture. But I had a hard time making any sense of Krishna’s philosophy, perhaps because it was being spoken on a battlefield, and I had left the Navy very inclined to a nonviolent life, after three years of analyzing aerial photography of the Vietnam war. However, I soon found there may have been a more profound reason for my trouble with Bhagavad-gita. When I walked back to my apartment later that afternoon, I seemed to see the world differently than the day before. It’s not that I had a clearly defined new world view; things just seemed different, and I sensed a change shaping up in my life. The next day, I went to the place where I had recently quit working to collect a paycheck I had coming, so I could buy my own copy of Bhagavad-gita As It Is. I also started attending the Bhagavad-gita classes held three nights a week at the temple. I remember still having difficulty dealing with the fact that this spiritual treatise was spoken on a battlefield, with the Lord exhorting His friend to fight -- against his relatives, friends, and teachers! I asked about it three meetings in a row. The temple president, Gaurasundar das, was very patient with me, explaining painstakingly the difference between spirit and matter, the body and the soul, and apparent nonviolence and real nonviolence. After three times, the concepts began to sink in, and I was hooked. On the alternate nights, I found myself in Waikiki, a member of the temple’s sankirtan party. During the day, I would walk from my apartment near Diamond Head up to the temple to help with the gardening duties. In particular, I was eager to help with the mango trees. The devotees had told me that their spiritual master, Srila Prabhupada, had declared the mango king of fruits and promised to visit Honolulu when mango season came. After a couple of weeks, it became clear that I was spending more time with the devotees than with my other friends. My interests had changed drastically in a very short time: less surfing, more serving. I began discussing the possibility of moving into the temple for more intense study and spiritual practice with my friends. Some were adamantly opposed, convinced that, although I was one of them, I was becoming brainwashed by all the chanting. Others suggested that, although it could be a big adventure, monastic life wasn’t for everyone. After some vacillation, I went down to the beach one day to sell my surfboard so I could pay my share of the rent for the month at my old apartment. Then I packed my few belongings and walked up to Manoa Valley to begin this adventure. "Completely rejecting all religious activities which are materially motivated, this Bhagavata Purana propounds the highest truth, which is understandable by those devotees who are fully pure in heart. The highest truth is reality distinguished from illusion for the welfare of all. Such truth uproots the threefold miseries. This beautiful Bhagavatam, compiled by the great sage Vyasadeva [in his maturity], is sufficient in itself for God realization. What is the need of any other scripture? As soon as one attentively and submissively hears the message of Bhagavatam, by this culture of knowledge the Supreme Lord is established within his heart." "But the devotees of the Lord rise above such competitions. They do not compete with the materialist because they are on the path back to Godhead where life is eternal and blissful. Such transcendentalists are nonenvious and pure in heart. In the material world, everyone is envious of everyone else, and therefore there is competition. But the transcendental devotees of the Lord are not only free from material envy, but are well-wishers to everyone, and they strive to establish a competitionless society with God in the center." This was the most radical idea I think I had encountered at the time, in the real sense of the word: it went right to the root of all our problems, and it offered the perfect solution. This, it seemed to me, was everything! I began to see that the Hare Krishna movement was not simply an exotic religion but a revolutionary movement. But this wasn’t the kind of revolution we had become accustomed to discussing in those days of social and political ferment. This, I was beginning to understand, was a revolution of the heart. I was interested in finding ways to change our culture. At the time, the most profound political influence in my life was Mohandas Gandhi. I had read pretty much every thing by and about him that I had been able to get my hands on. While I was still in the Navy, one of my friends had drawn a charcoal portrait of Gandhi that I displayed in my room in the barracks, and later in my apartment in Honolulu. I liked his idea of revolution based on nonviolent non-cooperation with evil. I found his search for Absolute Truth inspiring. I found his practice of observing celibacy, or brahmacharya, to re-channel his energy to effecting social change intriguing, if impossible for me. And I had been inspired by his faith in Bhagavad-gita to explore it myself. His approach to revolution, it seemed to me, was almost spiritual. But this approach was completely spiritual. And the more I read, the more clearly I could see this, the more firmly I became convinced. Later in the first canto, I read of Emperor Parikshit’s encounter with an abused bull. In the vision of the Vedic sages, the bull is Dharma, the personification of religious principles. At one point King Parikshit exclaims, “In the age of Satya [truthfulness] your four legs were established by the four principles of austerity, cleanliness, mercy and truthfulness. But it appears that three of your legs are broken due to rampant irreligion in the form of pride, lust for women, and intoxication.” In his purport Srila Prabhupada explains that the Dharma, religion, had been abused by Kali, the personification of the age in which we live, characterized by hypocrisy and quarrel. The pillars on which this age is built are destructive habits such as gambling, intoxication, unrestricted pursuit of sexual gratification, and meat eating. The antidote suggested here is a culture based on simplicity, cleanliness, mercy, and truthfulness. Now that was truly revolutionary, at least in my experience! And a little earlier, I had found the essential antidote for the influence of this age of discord. If we can make arrangements, Srila Prabhupada says, “for the constant chanting of the holy names, qualities, etc., of the Supreme Personality of Godhead, there is no chance at all” for Kali’s influence to increase the downward spiral of modern society. And Srila Prabhupada recommends using even modern technology for widely broadcasting the holy names of Krishna, as well as Krishna’s teachings. That was it. I was convinced that I had found the real revolution and that I had to dedicate my life to helping effect that revolution. I would somehow become Srila Prabhupada’s disciple and an instrument in his life’s work. 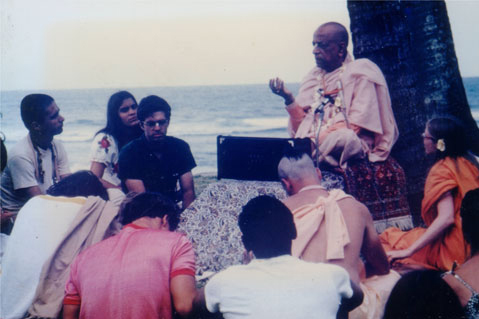 That determination was further solidified when Srila Prabhupada visited Honolulu in August of 1970. When I first saw him, my heart leapt, and I knew without any doubt that I had found my eternal teacher and that I could approach him without any reservation. When I did physically approach him to offer a flower lei and offer the common gesture of obeisance by bowing down to the ground, I inexplicably found myself so overwhelmed with spiritual emotion that I sobbed uncontrollably, unable to offer the prayers of dedication a disciple likes to make. Later, as we walked from the airport lobby to the car that awaited him, I held an umbrella over his head (yes, even inside the airport), he stopped for a moment and smiled broadly as he looked into my eyes. I felt as though he had accepted me as I had accepted him. I felt irrevocably committed to the spiritual revolution that is Lord Chaitanya Mahaprabhu’s sankirtana movement and have never looked back.